The median conversion rate for the pay-per-click industry is 2.35%. What if I told you that you can get 10x that number, without spending 10x more money? In fact, it will only cost you the time it takes to strategize and pay close attention to detail. We’re going to help you fill your funnel with qualified leads that are ready to buy from you, while we point out a few places where you may be “leaking” leads from your funnel right now. Pay-per-click campaigns that see a conversion rate of 25% or over are often called unicorns in the industry. But unicorns DO exist. Let’s take a look at how to become one. You Too Can Get 10x More Form Leads From AdWords Without Having to Spend 10x More! We know firsthand that this is possible because we’ve been able to do this for many of our clients who are in a variety of businesses, anything from ecommerce to B2B. It really doesn’t matter the business model, because once you understand a few key PPC principles and PPC frameworks, you can make AdWords a very powerful marketing tool. This article is for any VP of marketing, Digital Marketing managers and anyone who has an interest in learning how to generate more leads for their business through AdWords or any PPC (pay-per-click) campaign. If you are not interested in learning how to generate more leads through paid advertising, this article will not be useful to you. What are the typical problems marketers have with AdWords? We’ve worked with hundreds of businesses over the last 10 years and have noticed that each business we work with was extremely frustrated with their AdWords campaigns. The number one reason they are frustrated is usually because their current digital marketing agency told them that they’d be rolling in leads. And when things don’t seem to be working their current marketing agency can’t tell them why it’s not working. The second biggest frustration is that the marketing agency is not driving the strategy and lack any thoughts on PPC innovation. So then you are thinking, “why the heck are we paying these guys” when you seem to be the one coming up with all the new ideas. This leads to a bigger problem for VP’s of Marketing and Digital Marketing Managers because if things are not working, they are left holding the bag and don’t have the ability to prove ROI to the CEO, thus resulting in lower PPC budgets or cutting the PPC budgets all together. Because you can’t prove the ROI your budgets get halted, which doesn’t allow you to scale. If you can’t scale, you miss your lead targets. 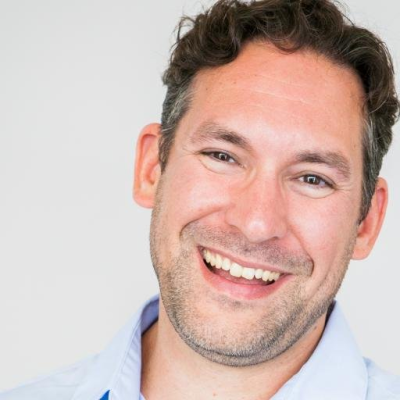 Next thing you know, you have sales blaming marketing that they are not getting enough leads and that is why your company is not hitting its sales targets. So then you, of course, tell them it’s the marketing agency who isn’t doing their job. Before you know it, everyone is blaming someone and people are frustrated. Well, it doesn’t have to be that way. You can eat your cake and have it too, but first you need to know you do not have an AdWords problem. AdWords works just fine when you have a proven system to follow. People will click on your ads and will fill out your forms when you can show them you understand their ‘intent’ and deepest problems better than they understand it themselves. This is why we invented a system called: The PPC Intent Engine. If you want to learn more about our PPC Intent Engine System you can sign up for the webinar here. We have found that there are 3 major mistakes most advertisers make that kill their AdWord’s campaigns. 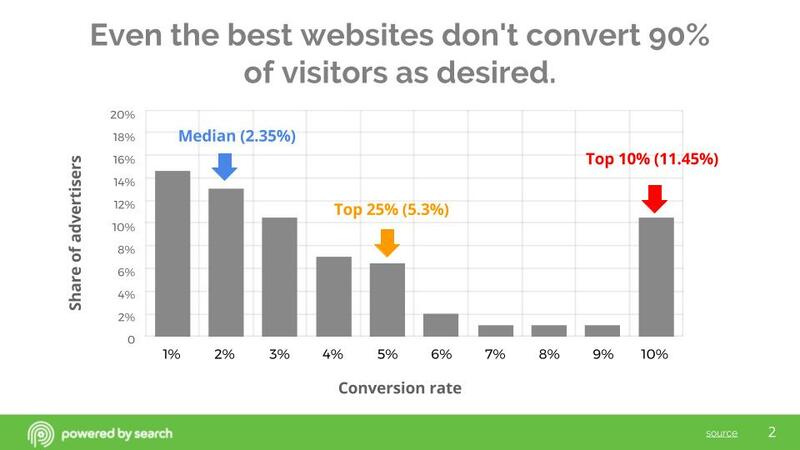 Common Mistakes That Show You Don’t Understand Your User’s Intent. The above screenshot is an example of having too many keywords per text ad. And yet, TD Canada Trust has one text ad serving over a hundred different search queries. This shows they DO NOT understand the intent of the user. This is one of the fastest ways to sabotage an AdWords campaign. It also makes CEOs and VPs think that AdWords doesn’t work. It’s really important to know if your company is making this mistake. If you do not understand the intent of the search query, then you will end up with a lower ‘click-through rates’ (CTRs), which means you’ll end up with a lower ‘quality score’ (QS) from AdWords, which means your ‘cost per click’ (CPC) will be more. Just see the graph below. Google ONLY cares about intent, so maybe you should too, unless you like paying the unnecessary Google tax. How can you tell if your AdWords Adgroups are setup to fail the intent test? It’s easy, just look at your Adgroups and if they have more than 20 keywords and/or if each AdGroup is bidding on search queries that have a different intent, then it’s a major problem. Another way to check is to use a spy tool like SEMRush, like we did with the TD Canada Trust example above. If you are not sure, and want us to check for you, just contact us here and we’d be happy to help. Let’s say you sell makeup, like Maybelline. You can see in the screenshot above that most of their creatives are only targeted at young women. This is a big mistake that is costing them probably hundreds of thousands of dollars. Let me ask you this, does a 25 yr old college student buy makeup the same way a 35 yr old stay at home Mom buys makeup? Does a 75 yr old Grandma buy makeup the same way a man buys makeup? Each buying persona you have buys differently and therefore you need to have a unique PPC creative and marketing funnel for each buyer persona. <- Tweet This! 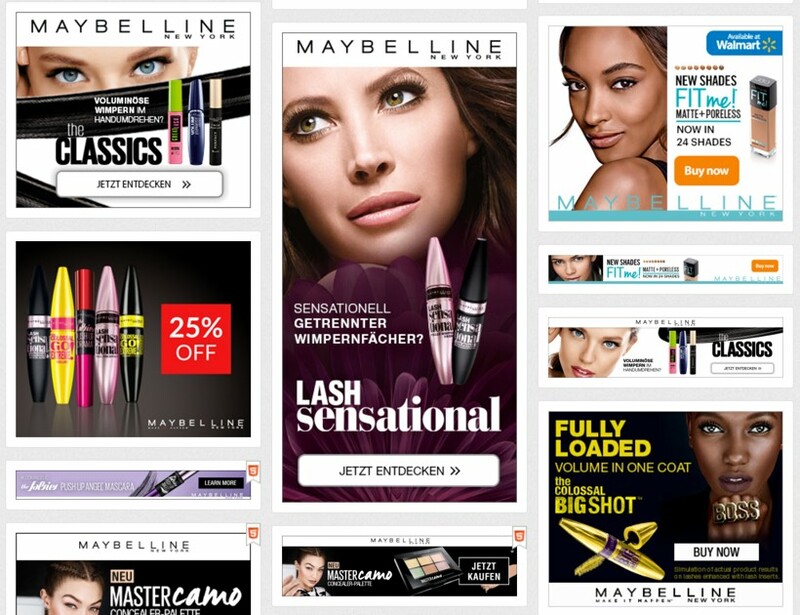 Because Maybelline is using a catch-all creative that only speaks to a young woman, they are missing out on showing other buyers how they could be buying this product too. On top of that, today we can segment our ads by many different categories and have the ability to mirror the demographics in our creatives to the specific buyer. So why are so many businesses using catch-all banner creatives??? This is a HUGE mistake. If your company is not segmenting your creatives into tightly themed lists, then it shows your company OR marketing agency does not fully understand the intent of your buyers. IMPORTANT NOTE: You need a banner creative per buyer persona. If you have 6 different buyers then you need at least 18 different creatives. Fear-driven buyers: Those that have FOMO (fear of missing out) and don’t want to fall behind the Joneses. Gain-driven buyers: Those that want what to save time & money. Logic-driven buyers: Those that want to weigh their options and make sure they make the best buying decision. 80% of the time most people buy based on emotions are driven by buyer type #1 and #2 listed above. However, if there are 3 major types of buyers and you have 6 different buyers then you’ll need 18 different creatives. Hence why we said you’ll need 18 different creatives if you had 6 different buyer personas. Many marketing agencies and businesses greatly underestimate how many creatives they need and end up doing one set of banner creatives. 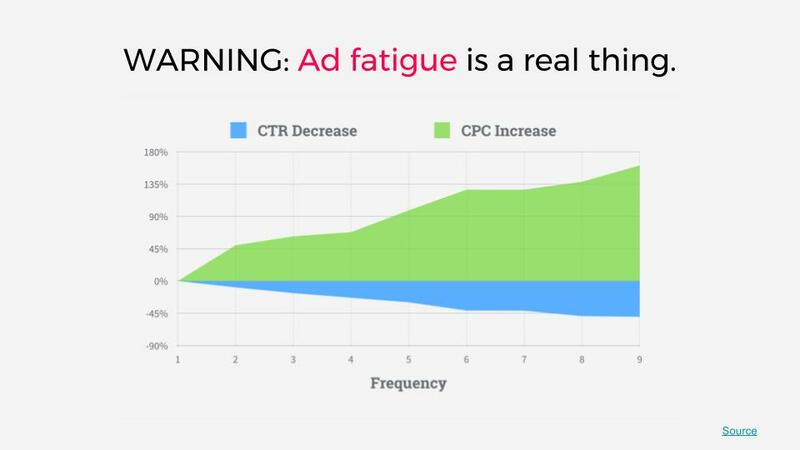 This catch-all approach is one of the fastest ways to drive down click through rates (CTRs) and to suffer from ad fatigue, which is a very real problem. 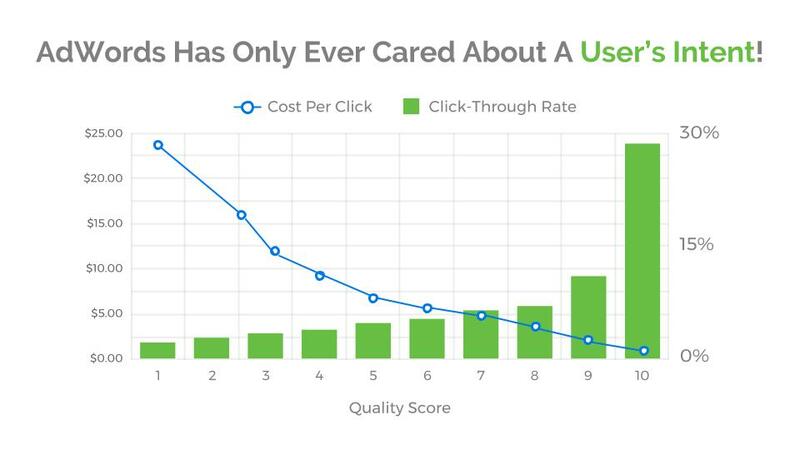 As you can see in the graph above, once someone has seen your ad creative 5 or more times, your click-through rates (CTR) decrease and your cost per click (CPC) increases. Go check your AdWord’s Display and Remarketing campaigns and see if you have enough ad creatives to match the 3 different buyers for each one of your buyer personas. If the answer is no, then you have a lot more work to do. The best way to understand this is to look at an example. It’s great ad creative. It makes a very strong offer that a lot of people would want. This landing page does NOT match the ad’s creative at all. It shows a cartoon character that is new. Basically, this landing page does not mirror the ad creative. The average median website conversion rate is 2.35%, which basically means that for every dollar spent, 97 cents is flushed down the toilet. If you want to increase your website’s conversion, the best way to do it is make sure your landing pages offer matches the ad creatives. Just remember, a confused mind never buys. We decided to take 20 minutes to rebuild how the landing page should be. Here’s how we would improve that landing page if we could. You can see how the landing page now matches the creative offer. There is one offer – a confused mind never buys! It clearly states what is going to happen next if you act on the offer. 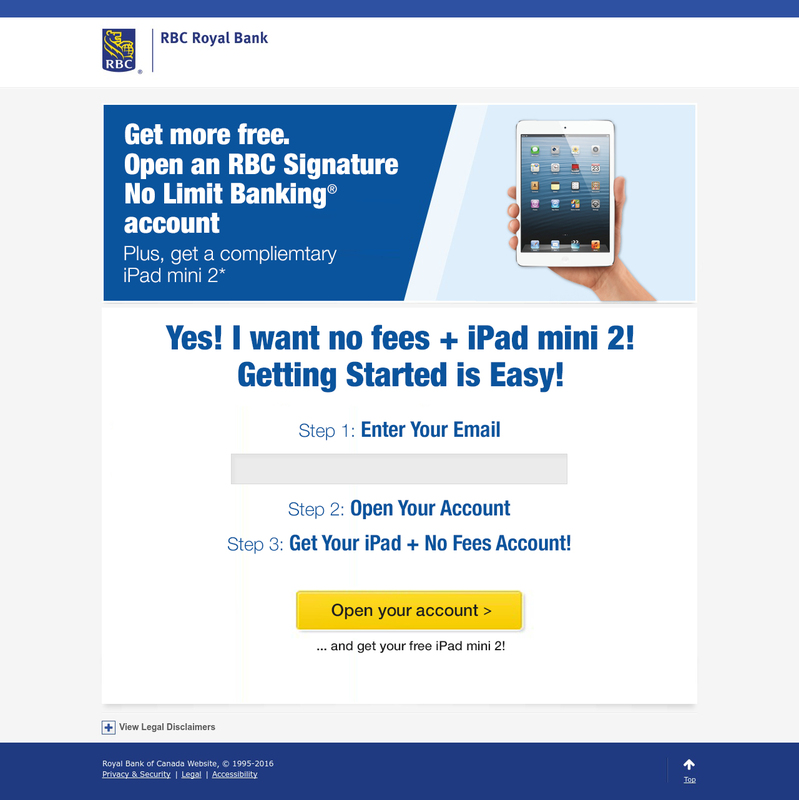 If RBC bank used our landing page, I can guarantee their conversions would skyrocket! BTW, booking an AdWords Accelerator call with us is easy, just click this link. MISTAKE #3 – Not presenting a clear single offer that easily allows a website visitor to get into your marketing funnel. Again let’s use a real-life example. We came across the creative below. This was retargeting creative that got me after I was searching for tickets to Arizona. Not only does it break the SCENT from creative to landing page because nowhere does it mention the 20% off, but it also provides way too many options for me to act on. When we make this kind of offer we want to keep the offer simple and the goal is to get the user into our marketing funnel as soon as possible. Let’s expand a bit on why having too many choices is bad. If you present a user with too many options, they don’t know what to do. So they’ll do nothing and usually bounce. This sends signals to Google AdWords that your landing page is not doing a good job of solving the user’s problem. This can also lead to a lower quality score (QS) and end up costing loads more in cost per clicks (CPCs). Often less is more and in this case above it really rings true. There was a whole book written on this topic called “The Art of Choosing” and it proves that when people have fewer options,sales increase. And just in case you don’t believe me, there is case study after case study that shows that less often leads to more conversions. The second mistake that people make is not making it easy for people to get into your marketing funnel. You want to be able to collect their email address as soon as possible so you can indoctrinate and educate them and you can only do that if you have their email address. Can you see how we removed ALL distractions? How we mirrored the offer from the creative. 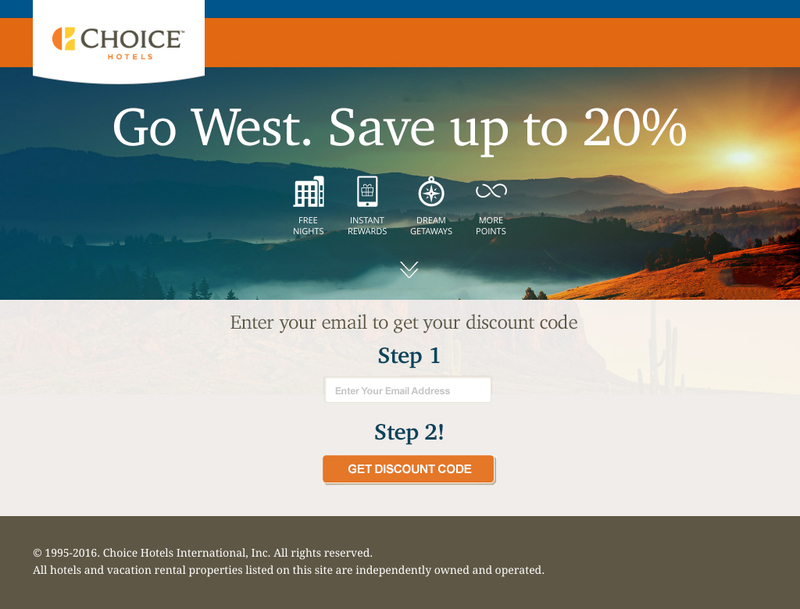 How we made a simple process to get the discount by having the user enter their email address. So we can then use email automation and custom audience advertising to educate and indoctrinate the prospect over time. Once you have an email address from your website visitor, then they move from “rented traffic” to “owned traffic” and everyone knows that “owning” is better than “renting”, right? The best ways to increase your form leads is to move away from tunnel vision and towards funnel vision. What you need to look for, and look out for, with your AdWord’s landing pages. Check to see if you have a single offer that matches your creative’s offer. Check to see if you have a simple 1-step process to get people’s email address, so you can get them into your marketing funnel. Make sure you have enough AdWords creatives to match the intent. Make sure the scent from creatives to landing pages matches the intent. Make sure you have a streamlined offer that easily allows people to get into your marketing funnels. You are getting a solid ROI from your AdWords campaigns. Your sales team will be ecstatic with the volume of leads coming in. Your CEO will want to give you bigger budgets to scale out this lead generation strategy more! You can continue to keep doing the old way and watch your AdWord’s campaigns fail or you can do the new way and start getting the leads your business deserves. 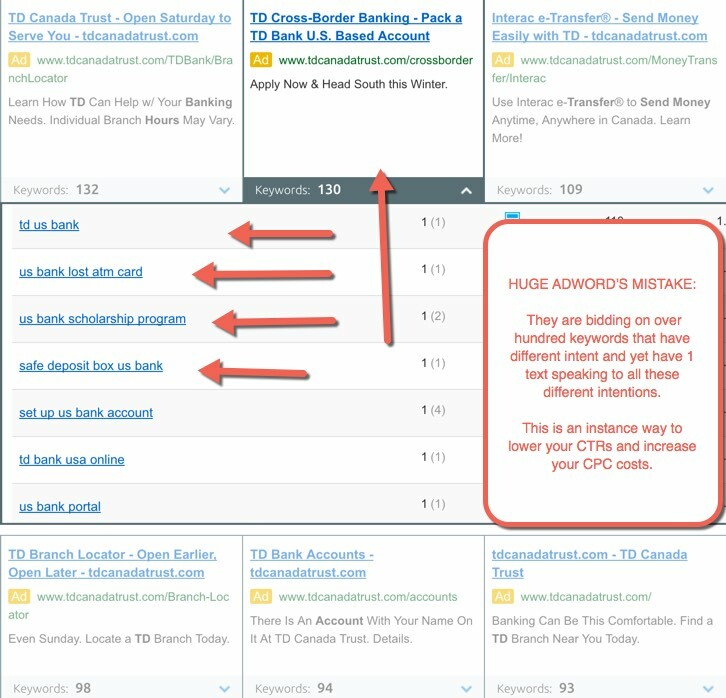 The first thing you will want to do is audit your AdWords account for these 3 mistakes. If you want help auditing them, you can book an AdWords Accelerator call with us here. The second thing you will want to do, is realize this is just 3 of 80 things you need to know to really make your AdWords account a lean mean marketing machine. 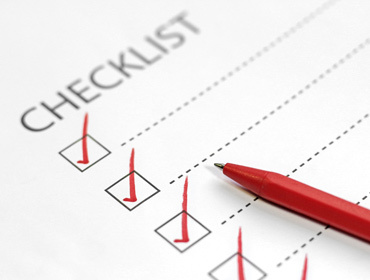 This is why we invite you to download (for free) our AdWords 80-Point Checklist. This checklist will show you everything you need to think about before launching an AdWords campaign. If you liked this content, comment below and share it with someone who’d appreciate it. Thanks for stopping by and we hope this helps you get 10X more without spending 10X with your AdWords campaigns.